Every month, from May to October, 160 cyclists are injured in B.C. (This sad statistic is from ICBC). Whether on fat tires or skinny tires, everyone driving and cycling, needs to share the roads and the responsibility for safety. 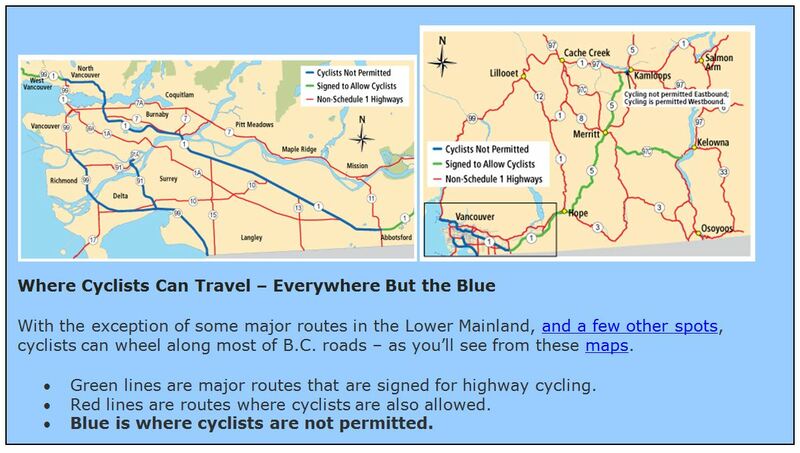 Cyclists are entitled to use the majority of provincial roads – from smaller two-lane highways around popular cycling destinations, to remote highways like the Stewart-Cassiar, to high-speed, high-volume routes like the Lougheed Highway (Highway 7). Plenty of people cycle provincial highways to commute to their jobs, whether in Northern B.C. and Vancouver Island, or the Lower Mainland and Southern Interior, and not just during Bike to Work Week. Plus cyclists pedal provincial highways for recreation, fitness, tourism and occasionally, competition. In some places, the routes may not have shoulders or bike lanes. In others, they do. Wherever cyclists and drivers may be, here are 10 ways to savor the open road, stay aware of all types of travellers and keep safe. Don’t drive on the shoulders and don’t cut into the curve – there may be a cyclist (or pedestrian) around that bend. Watch for cyclists, if you’re turning onto the highway from a driveway or other road. Shoulder check before turning right, and scan for cyclists when turning left, to ensure you spot cyclists. Keep your bike tuned up – especially before the season’s start and bigger bike treks. Do it yourself or turn your two-wheeled transport over to a bike mechanic. Before you launch, plan your route to travel bike lanes and paths as much as possible. Cycling routes can be found on Google Maps and many municipal websites. Be sure your bike’s headlight can be seen at 150 metres, and your rear red light and reflector is visible from 100 metres. Wear reflective gear to help keep you visible in all weather and at all times of day. Stay tuned to what’s around you – not to ear buds. Look well ahead for hazards like gravel, potholes and wildlife. Watch for vehicles entering your route from other roads or laneways. B.C. is a big, beautiful province for driving and cycling. No matter what your tire width, you can enjoy the open road and help keep everyone safe, by watching out for all types of wheeled transportation. Have you checked out BikeBC, where you’ll find loads of useful information, including how we’re working with communities to enhance cycling infrastructure? Drivers are expected to know and follow the laws of the road, which include not passing cyclists (or farm equipment, or any other slow moving vehicles) when it is not safe to do so. There is signage to assist drivers and cyclist, however. We use “CYCLISTS ON ROADWAY” signs, picturing a vehicle next to a cyclist, to warn drivers that cyclists may be on the roadway. This sign is used where the presence of cyclists would be unexpected by the motorist, or where there tends to be heavy cycling traffic on the route. We also use centre lines (double solid and cautionary single solid) showing where passing in opposite lane is not permitted (former) or requires discretion (latter). We live north of Qualicum near Corcoran Rd and I often run in to groups of cyclists taking up a full lane, if not the whole road. Just so I am clear, is it true they should ride single file and stay as far right as is safe ? It’s almost impossible to get past them sometimes when thye are slower than the speed limit which can be frustrating as it is a long road. Thanks for your question and for connecting with us here. According to section 183 of the BC Motor Vehicle Act, cyclists are required to ride single file and stay to the right in order to allow the movement of traffic on BC highways. (h) must not ride a cycle on a highway where signs prohibit their use. Are bicycles required to travell in single file as apposed to grouping up as though they were in the Tour DE France. Great question. According to the BC Motor Vehicle Act referenced below, yes, they must ride single file. I second what Dave says above. Share the Road signs are ambiguous and actually rather dangerous. It is time to change them for signs that say “Bikes may use Full Lane”. I live on Hornby Island and our roads are too narrow for a car to pass a bike in the same lane. We have very rough and uneven shoulders and narrow two lane roads. But we have many, many visitors in the summer and many tourists with bicycles. It makes for a very unsafe environment if the drivers don’t understand that they cannot pass bikes in the same lane! Thanks for connecting with us here and sharing your concern. We have shared your comment with our Traffic Engineers for review. Thanks again! Thanks for connecting with us here and sharing this. We have forwarded your comment to our traffic engineers for review. I think all cyclists should have rear view mirrors so that you know what is going on behind them. I use one mounted on my helmet so by twisting my head a little I can scan a broad scene. Here in the Interior we have lots of logging trucks. Say you’re cycling toward an inter section leading into the mills. Looking in your mirror you see a logging truck coming and you can see that its got its right signal light on. No sense trying get through the intersection first. You can slow down or maybe even stop to let it make its turn. Maybe someday you’ll hear a vehicle coming up behind you with a siren on. A glance in your mirror and you’ll know to pull over and stop. Checking your rear view mirror often will prevent sudden surprise when something over takes you; like an electric scooter! They don’t make any sound! But you`ll have seen it coming in your mirror! Have a great safe summer cycling! !